I am a chronic doodler. 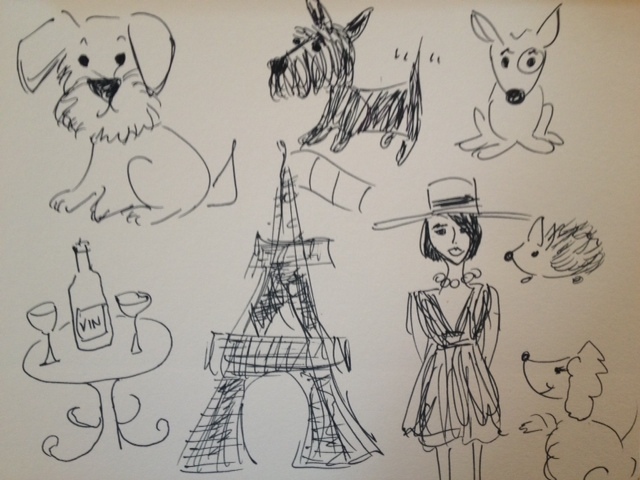 I’ve been chided my entire life for doodling, from grade school to college and at various jobs. There has always been a long line of critics of doodlers. Parents, teachers and bosses admonish us to put our pens down and pay attention. I have often been the recipient of the disapproving eye-roll whenever I begin to draw in meetings with non-doodlers (yet ironically they are the ones constantly checking their smart phones throughout a meeting). At one agency where I was on the management team, I doodled away in board meetings and on weekly conference calls. Most of my colleagues (especially our CEO) showed signs of annoyance whenever I doodled through weighty discussions. It was obvious to me that most were thinking that I was bored or uninterested, but that wasn’t the case at all. It was actually the times when I couldn’t doodle in a meeting (say a new client meeting or presentation), where I had more trouble concentrating and became bored. It turns out, I’m not alone. There are many doodlers out there who get the same grief as I do from co-workers and bosses. But guess what? There is actual research that vindicates us and confirms what we’ve already known – that doodling doesn’t mean we are unfocused, but rather the opposite: doodling can actually aid in concentration. According to a study published by psychologist Jackie Andrade that appeared in Applied Cognitive Psychology in 2009, basic doodling can actually help one focus better and it aides in preventing daydreaming which actually takes one more off task and out of focus. Results of the study showed that individuals doodling through a meeting retained information 29% better than their non-doodling counterparts (view the study at http://bit.ly/R4X5lh). Even former U.S. Presidents were avid doodlers. Thomas Jefferson, Ronald Reagan and John F. Kennedy were known to doodle during meetings according to an article from The Atlantic http://bit.ly/OpWESj. Leonardo di Vinci was an avid doodler as is Bill Gates. So, to all of you bosses out there, please give your doodling employees a break, or better yet, join in. And to all of my doodling peers: Keep calm and doodle on! (Sorry, I couldn’t help myself – oh and by the way, apparently Tony Blair is a doodler too). « Are all the Social Media tools available to us now making us more efficient and less stressed, or the opposite? Are you really ready to hire an agency? 4 Questions to ask yourself. When to hire an ad agency?